CITRUS + VITAMIN C | Face Scrub : Brightening Fruit + Sugar Scrub with micro-fine sugar to exfoliate and give you that glow! Citrus goodness to exfoliate + brighten :) Sweet! Naturally rich in Vitamin C, fruit powders and special sugars brighten and smooth. Comes in a beautiful, reusable, glass jar! Exfoliating + Brightening + Invigorating. Exfoliation is by far one of the most vital steps for healthy skin. Regular Exfoliation helps all of your products work better. This is NOT a harsh scrub, but gently exfoliates. The very fine sugar dissolves before you can over-exfoliate. 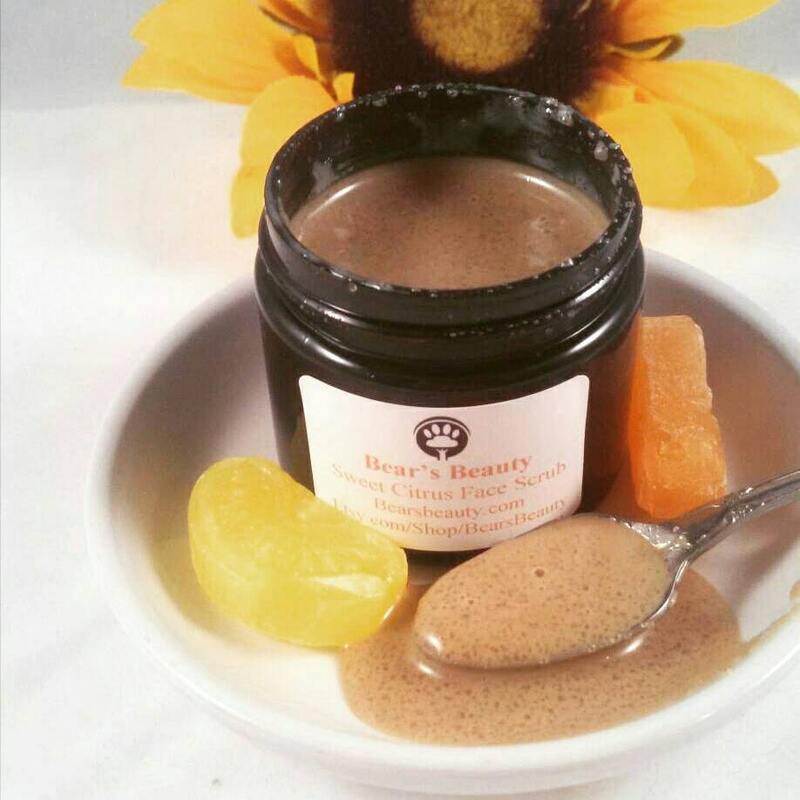 Caster Sugar gently exfoliate and as they dissolve soothe as well as moisturize skin. Fine grain Caster Sugar offers super gentle exfoliation. Oil-soluable Vitamin C brightens complexion. Vitamin C not only helps reduce signs if aging like marks, but it also helps increase collagen production. Organic Glycerin moisturizes and draws moisture into your skin. Kaolin Clay gently detoxes skin without stripping. Bergamot + Sweet Orange Essential Oils smell bright + fresh + renew the look of dull skin. Use dry hands or clean tool or squeeze small amount into hands. Massage into damp skin using gentle pressure, rinse, pat dry. One of my favorite products!!! First, Jerra is a doll to deal with an her products are so amazing. This scrub not only smells fantastic but it works really well too. LOVE THIS SCRUB! I have NEVER used a scrub that has actually made my skin feel like silk afterwards. It did! It was soooooo smooth. LOVE LOVE LOVE IT. Cannot wait to see how it helps my skin!